The Holiday season may be behind us, but there is one big holiday ahead causing a major stir in the hearts and wallets of the consumers - Valentine's day. We saw a positive rise in sales during the Holidays and this trend is set to continue through Valentine's. The National Retail Federation reports that consumers are not done spending yet and this year they will be much more likely to dig deeper into their pockets for their loved ones. According to the Valentine's Day Consumer Intentions and Actions Survey, conducted by BIGresearch, this year the average consumer will set aside $116.21 for Valentine's day gift and the projected sales for the period are expected to reach $15.7 billion. NRF President and CEO Matthew Shay notes that "Jewelry, candy and apparel sales should provide a nice boost for retailers during the typically slower months of January and February." Another survey conducted by eBillme adds futher details to the forecast. They predict that 32% of the consumers will shop online for a gift this Valentine's Day; compared to 23% in 2010. While customers are on the hunt for better deals, be it on- or offline, the rapid growth in online sales presents a huge opportunity for the online merchants to build on the gained Holiday sales momentum. And to be able to make the most of the Valentine's shopping spree, retailers need to make sure that their sites are always accessible and their performance is up to par with the industry's standards. To check how the online retailers will handle the pressure WebSitePulse is monitoring ten of the most popular online shopping destinations for the 2011 Valentine's Day. The measurement results from the transaction monitoring reflect the performance levels and the availability of the ten websites related to the increased Internet traffic during the period. This information is helpful to analyze the End Users' shopping experience, the reliability of the IT infrastructure of the Internet retailers, as well as their estimated losses in case of downtime and unavailability of critical websites, web pages, web systems, network devices, and web applications. 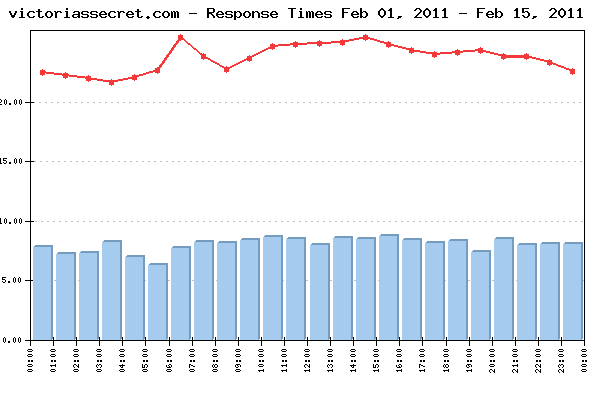 The daily Average Response time from all monitored websites was 22.496 sec. The Average Response time as measured from the US East Coast (Washington, DC) was: 19.954 sec. The Average Response time as measured from the US West Coast (San Francisco, CA) was: 29.808 sec. The Average Response time as measured from US Central (Chicago, IL) was: 17.726 sec. The Best Response time measured from US East Coast: 7.150 sec. The Best Response time measured from US West Coast: 8.852 sec. The Best Response time measured from US Central: 3.882 sec. The typical shopping transaction took the least time for victoriassecret.com visitors - 7.336 sec., while the visitors of candy.com had to be the most patient, as the shopping transaction there took in average of 48.557 sec. 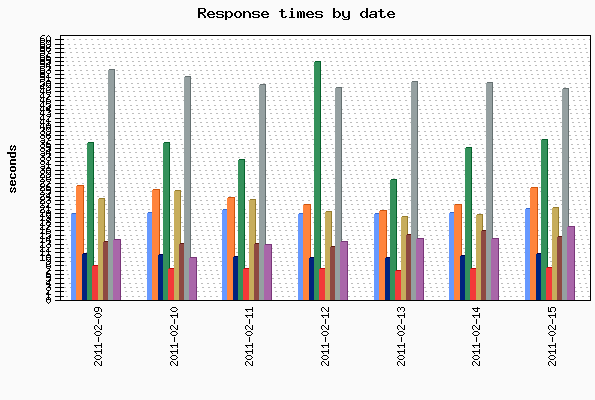 Three of the monitored websites delivered above-the-average response times for their transactions, while six of them demonstrated below-the-average daily performance. 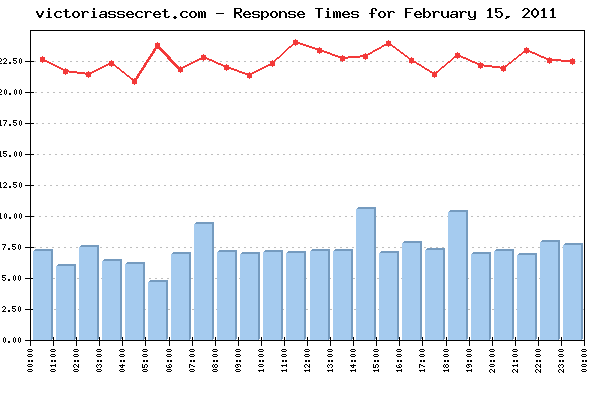 The daily average uptime for the entire Group was 99.67%. Seven websites' availability was above the average, while two sites dragged the average down with below-the-average availability. No events of particular importance or possible negative impact on the online visitors' interaction with the Websites included into the 2011 Valentine's day report were detected during the reported period, and according to WebSitePulse, the Group delivered the expected levels of End-User experience and Customer satisfaction. The 2011 Valentine's Day Reports reflect a complete fullpage web transaction, representative for the End Users' interactions with a website. The reporting period covers the dates between February 1 and February 14, 2011. Performance and availability measurements are made for a typical multi-step web transaction at 15 minute monitoring interval, every day 24/7. The WebSitePulse application monitoring service is used to collect data and to create the reports.